Connect with your peers at the Medi’Nov 2018 conference and get the latest on innovative technologies developed for the medical technologies industry. 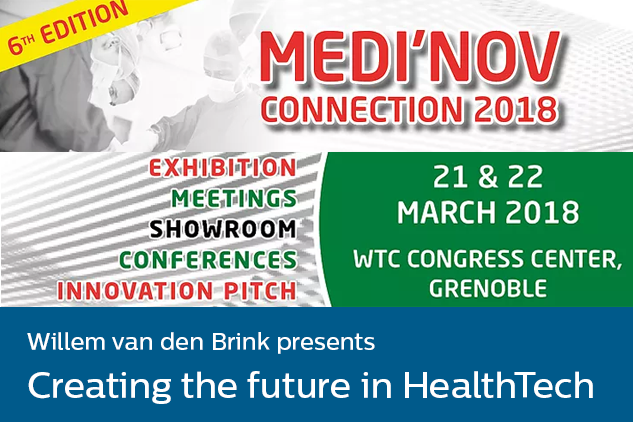 Willem van den Brink from Philips Innovation Services will give a presentation on creating the future in HealthTech at the Medi’Nov conference. Improving people’s health and enabling better outcomes across the health continuum from healthy living and prevention, to diagnosis, treatment and home care by using innovative technologies. Examples of vital sign monitoring and wearable sensor technologies. Activity monitoring and fall detection technologies are used to enable home safety solutions for independent living of the aging population. Wireless power-transfer in medical devices enable powering and/or charging wearable devices, in-vivo or ex-vivo. MEMS & micro-assembly is an enabling technology for digital health solutions. CMUT is discussed as an example of an innovative Ultrasound Sensor Technology for ultrasound images.